You get to the destination and we take over from there! 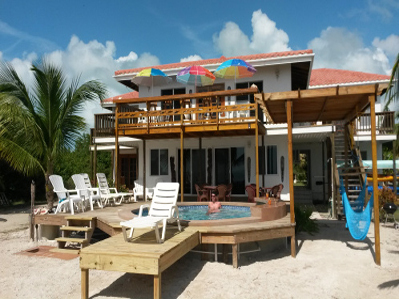 Join Mad River/MWFF Instructor and host Jerry Darkes on beautiful Ambergris Cay in Belize. 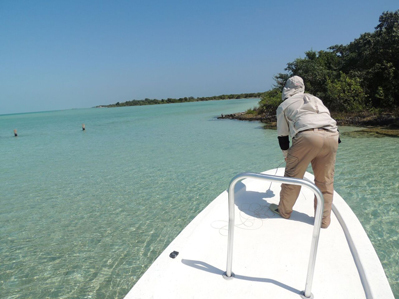 This is one of the best places around to get the holy grail of saltwater fly fishing- a bonefish, a tarpon and a permit on a fly. It is also one of the best places on Earth for a beginner to experience flats fishing for all of these species. We will stay at the Blue Bonefish Lodge, a picturesque villa right on the ocean within sight of the world's longest barrier reef. The 7-day package includes 6 days of guided fishing, lodging, meals, and the use of all the lodge's amenities including freshwater pool, golf carts, kayaks and paddle boards. This is also a great trip for couples as there is plenty of non-anglers to do. The city of San Pedro has lots of shopping, a large selection of great restaurants and night life, plus there are side trips available to other islands and the mainland. It's easy to get there! 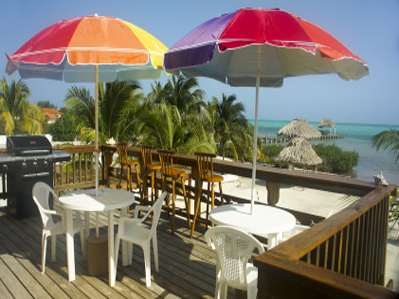 Fly to Belize City, BZ, then catch a short flight or water taxi to the city of San Pedro on Ambergris Cay. 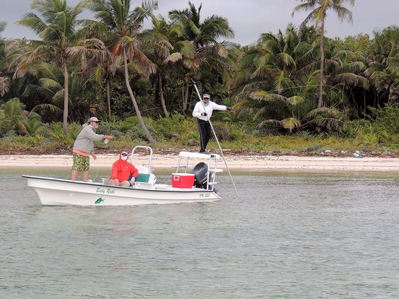 The Blue Bonefish will provide free transport from there to the lodge. 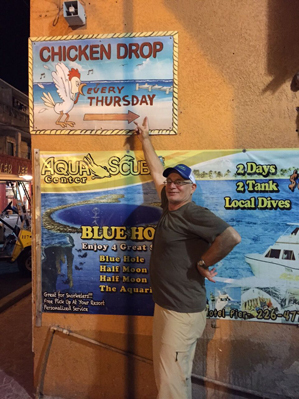 Join Jerry Darkes in Belize! Read over the information here on the website and don't hesitate to let us know if you have any questions. A trip information packet which includes recommended gear and flies will be provided upon sign-up and is also attached here. The Johnson family has been outfitting and hosting trips to amazing saltwater destinations for over 2 decades. When they made the decision to operate their own Caribbean lodge, they began searching for the perfect location. They wanted a lodge that was far enough south to avoid most of the adverse effects of the relentless winter cold fronts that so often plague south Florida and the Bahamas, but that offered the same sort of amazing sight fishing opportunities that these great fisheries provide. What they found was paradise, facing the second largest barrier reef in the world and only 4 miles south of San Pedro, Belize. There are miles and miles of beautiful white flats hosting massive schools of bonefish that often number in the hundreds. 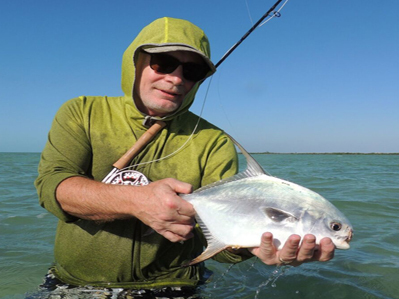 Year ’round shots at tarpon and a better chance to land a permit on a fly than you will have almost anywhere else in the world. 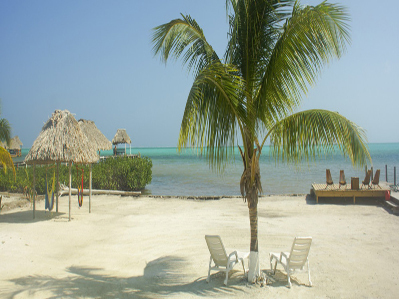 If you are a fly fisherman, you probably already know that Belize is a mecca for flats fishing, but it is also a favorite destination for families and couples that enjoy the unparalleled scuba diving and snorkeling available less than a mile from our beach. Golf carts, kayaks, stand up paddleboards and bicycles are available for our guests to borrow to go out and explore the island. Loaner rods are also available for use if needed. The lodge itself offers the high level of comforts and amenities needed to entertain the non-fishing members of your family or circle of friends, allowing you to escape to the flats without guilt. We start with the six private staterooms, each with 20160101_113457a private bathroom, tile shower and personally controlled air conditioning. 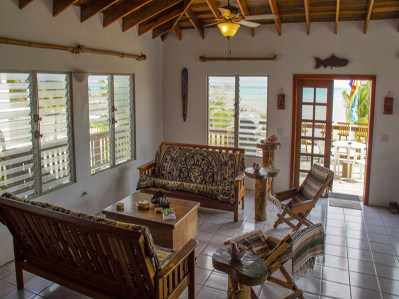 Each room has custom made Belizean mahogany furniture, tile floors and are tastefully decorated with local artwork and carvings. The expansive living and dining area has 270 degree views of the ocean and the barrier reef and features French doors that open out onto an upstairs deck with a grill, outdoor tables and a breakfast bar that overlooks the beautiful blue Caribbean. Each of the roomLodge-19s open out to one of our decks facing the ocean. The downstairs decks wrap around our pool that features a swim up bar and a seating area to relax in and cool off at the end of the day while sipping a cool drink watching the sunset. The sand beach area at our 100′ of ocean frontage features multiple social areas. Choose from a relaxing hammock chair in our shaded palapa, a swing seat in our shaded poolside pergola, a beach chair down in the sand or on our waterfront raised deck or a chair at one of our shaded outdoor tables. Or take a stroll out to the end of the long community dock and enjoy the cool breeze while sitting under the large palapa 200′ from shore. Make sure that you grab a towel, in case you decide to take advantage of the swim platform and ladder located at the end of the pier. Tarpon, Bonefish and Permit! Catching all three of these elusive flats fish in the same day is known as a “Grand Slam”. The ultimate goal of the saltwater fly fisher. In many areas, this would be a once in a lifetime event. Here at the Blue Bonefish, we see a guest or two accomplish this great honor almost weekly. The Holy Grail of saltwater fly fishing. These fish test your skills, your wit and your will. 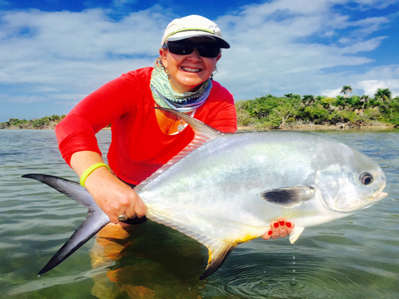 With great numbers of permit traveling the waters that surround our lodge you will likely have multiple shots and see multiple schools….in a single day! However don’t think that it will be easy; they are still permit after all. Well known as a tarpon fishery, the lodge sits in the middle of prime tarpon waters. Many of the docks nearby have tarpon roaming them day and night. With fish in the 20-50 pound range frequently roaming the flats and channels and adult fish in the 50 to 100 pound range migrating through the area during the summer. The bread and butter of the flats. This is how you prepare for the big leagues. Even though they are the easiest to catch, our bones will still challenge the seasoned angler. Many shots at schools as well as tailers ensure that nearly everyone can get their fill of bonefish here at Blue Bonefish. If you want a challenge, search out the big singles and doubles cruising the edges of flats. We definitely offer world class bone fishing here in San Pedro. In addition to these three glamour species, fly fishermen can try for snook, barracuda, jacks, ladyfish, snapper, cobia, triggerfish and mahi. Any questions on the fishing or gear for this trip, please don't hesitate to contact us at 614-451-0363 or shoot us an e-mail at [email protected] A trip information packet will be provided on sign-up. 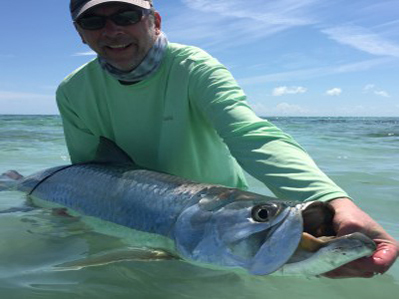 We are thrilled to have Jerry Darkes as the host of our trip to the Blue Bonefish Lodge in Belize for 2018! Jerry has been fly fishing for well over 40 years now and has been in the fly fishing industry as a rep, author, instructor and consultant for nearly 25 of those. He is well known throughout the Midwest and highly respected as a true professional at what he does. Mad River Outfitters has been working with Jerry for most of those years and he has been a big part of what we do around here. You can find him on several of our hosted trips each year as well as instructing schools and classes for our Midwest Fly Fishing Schools. 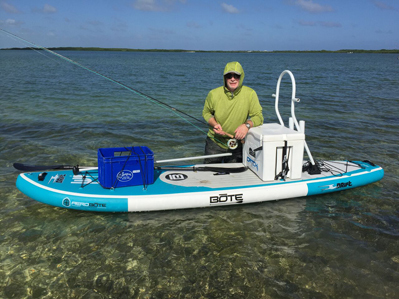 Jerry is a very experienced saltwater angler and has been to the Blue Bonefish countless times. He will be there every step of the way to ensure that you have the trip that we promised and then some. Register HERE for this trip! Any questions please give us a call at 614-451-0363 or send us an e-mail at [email protected]. Jerry's expertise and helping you have the saltwater experience of a lifetime! Any questions or to sign-up for one of the trips don't hesitate to give us a call at 614-451-0363 or drop us an e-mail at [email protected]. Book your trip Online HERE NOW! To book one of our hosted weeks or to arrange a trip for other dates for the 2018/2019 season - give us a call at 614-451-0363 or send us an e-mail at [email protected]. We'll get you set up. *If it's still listed, there are still spots open! We'll let you know the exact status of your reservation within 24 hours or so! Can't make our hosted trips? 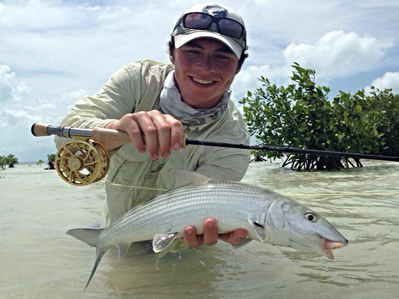 Let Mad River Outfitters put together a trip for you or your group at the Blue Bonefish Lodge! Give us a call at 614-451-0363 or drop us an e-mail at[email protected]. We'll be happy to help! * be sure to click on the "Slideshow" in the options tab in the upper right! 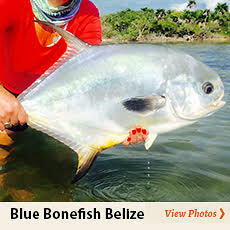 Mad River Outfitters is proud to serve as a full booking agent for the Blue Bonefish Lodge in Belize. Join us on one of our hosted trips or let us put together a custom trip for you and/or your group!